When it comes to your vehicle, brakes are one of those features that most of us tend to take for granted. Even though they are critical equipment when it comes to safety and effective performance, we don’t even really think much about them, until there is a problem. Knowing the warning signs before the problem escalates is key to safe and efficient driving. Not to mention a surefire way to save some money by avoiding expensive repairs. Pay attention to these tell tale signs, any and all of which should send you to your nearest brake repair shop in Albany NY. You don’t have to be an auto mechanic to detect and even assess issues with your brakes. All it takes is a quick visual review and a careful listen. When you look at your brakes, it is easy to determine how much wear and tear they’ve suffered by closely examining the brake pads. You can do this by looking through the spaces between the spokes on your wheels and seeing how much of the brake pad remains. You should be able to see the exterior pad against one of the rotors. See if the pad measures at least one-quarter of an inch. If it looks like it measures less than that, you will want to schedule an appointment to have your brakes properly and professionally inspected, and possibly even replaced. If you find that it’s difficult to assess the condition of your brakes visually, then listen to them closely. When you apply pressure to the brakes, are you met with a sharp screech or whining sound? If the answer is yes, then what you are hearing is an indicator, which is just a tiny metal shim, that is audibly alerting you to the reality that your brakes need to be replaced. This sound, while loud enough to recognize even when the windows are up, could potentially be drowned out by your radio or climate control system. So, take a moment to turn those systems down or off and listen for the presence of that sound. Hearing it on a regular basis is reason enough to immediately contact your mechanic and schedule a service appointment. That said, you should also be aware of this noise following lots of wet weather or after washing your car. In this case, your brakes are likely in good condition and don’t need to be repaired. You’ll hear the squeaking noise as a result of a small layer of rust which builds on the brake rotors due to moisture accumulation. Expect to hear this noise for the duration of three or four stops before the rust wears away, ridding your car of that sound in the process. Let’s say you haven’t seen or heard anything troublesome with respect to your brakes. They might still be in need of repair based on performance. A few specific experiences behind the wheel might indicate that your brakes are in need of attention. Check their action and see if you notice any of the following symptoms associated with faulty brakes. You might experience what is referred to as “fading” if your brakes are slow or sluggish to respond when you engage them. Some drivers report feeling as though the brake pedal is sinking into the floor. This is likely the result of a brake system leak. There are two kinds of leaks: air leaks, which occur in the brake hose, or a fluid leak. Brake fluid leaks are evidenced by the appearance of fluid accumulating underneath the car while it is in a parked position. It will look almost like motor oil, but the texture is a bit smoother and cleaner looking. If you have sinking that feeling that your brakes are not responding as they should, consult with your auto mechanic and see about possibly repairing what is likely a leak. If you feel your car veer to one particular side, as though it is being tugged or pulled in that direction when braking, your brake linings might be unevenly wearing or you might have some foreign object or particle in the brake fluid. In this case, your mechanic will either adjust your brakes so that they wear uniformly, or the brake fluid might need to be drained and replaced completely. Once again, you’ll need to rely on your ears in this case, but if you hear noticeable metallic sounds, like grinding, your brake pads have completely worn out. 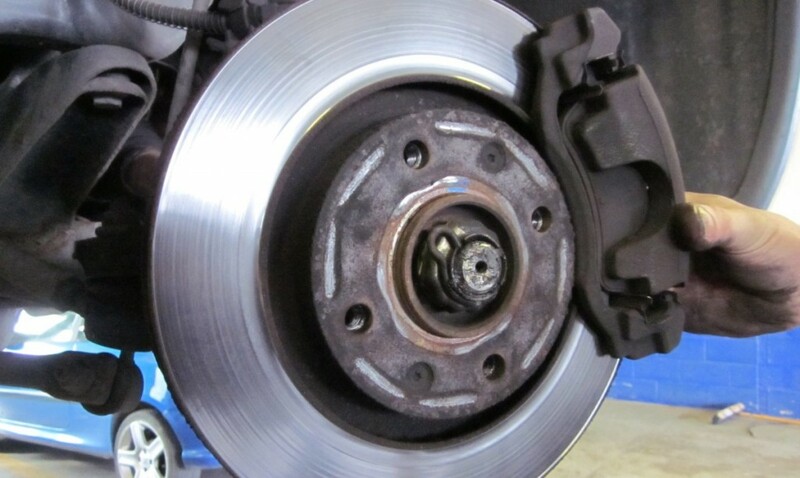 The noise you’re hearing is the result of the disc and the caliper rubbing together, which can scuff up your rotors, resulting in an uneven surface. In this case you’ll have to replace more than just your brakes. Your mechanic will most likely recommend that your rotors be “turned,” which smooths the rotor surface. Failing that, your rotors will have to replaced. There are two possible culprits that cause vibrating or pulsing from your brake pedals. Either your car has warped rotors or it needs to be realigned. Only a professional mechanic can accurately diagnose this, so schedule an appointment at the first sign of shaking. What are warped rotors and what causes them? Warped rotors result by hard braking over substantial durations, like towing or descending steep grades. The friction resulting from this kind of braking transfers an enormous amount of heat to the rotors, which causes them to warp. The brake pads fail to evenly connect with the surface and you experience shaking when you try to engage the brakes. A word of advice when driving under these conditions – make frequent stops to give your brakes a chance to cool down. Not only are your brakes a crucial component when it comes to safety, they can be costly to repair if you let some of these issues linger. Make it a point to pay attention to your brakes and address any changes in their performance as soon as you notice them. Not only will you save money, you’ll safeguard yourself and your passengers when traveling.